This is a scalable context timeline. It contains events related to the event Spring 1996: 9/11 Hijacker Hanjour Stays in Florida. You can narrow or broaden the context of this timeline by adjusting the zoom level. The lower the scale, the more relevant the items on average will be, while the higher the scale, the less relevant the items, on average, will be. 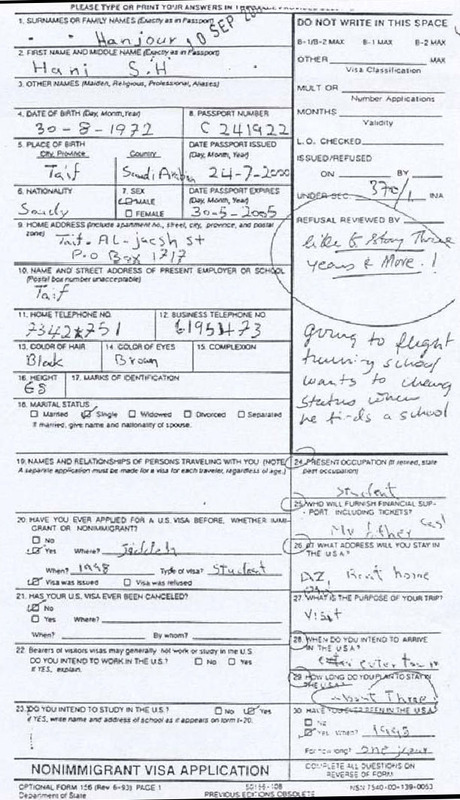 Hani Hanjour’s September 10 US visa application, which was rejected. The fact he requested permission to stay in the US for three years is highlighted on the right. [Source: National Review] (click image to enlarge)Future 9/11 hijacker Hani Hanjour applies for a US tourist/business visa at the US consulate in Jeddah, Saudi Arabia. 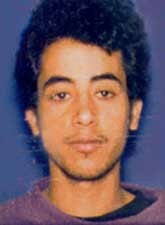 Hanjour, who has already spent a good deal of time in the US (see October 3, 1991-February 1992, Spring 1996, October 1996-December 1997, and 1998), uses a passport issued on July 24, 2000. His application is incomplete, as he says he is a student, but fails to give his school’s name and address. After his application is screened, he is referred to a consular officer for an interview. [9/11 Commission, 8/21/2004, pp. 13, 174-5 ] This consular officer is Shayna Steinger, who issues a total of 12 visas to the 9/11 hijackers (see July 1, 2000). [9/11 Commission, 12/30/2002, pp. 2; Office of the Inspector General (US Department of State), 1/30/2003] Hanjour’s application is denied as he says he wants to stay in the US for three years, raising concerns he might become an immigrant. Hanjour also says he wants to attend flight school in the US, changing his status to “student” from “tourist” after arrival. However, this is another reason Steinger denies the visa application, “because he has been in the States long enough to decide what he wanted.” Hanjour will return to the consulate two weeks later and successfully obtain a visa from Steinger using a different application (see September 25, 2000). [9/11 Commission, 8/21/2004, pp. 13, 174-5 ] Steinger will later give a series of conflicting explanations about why she reversed her decision and issued the visa (see August 1, 2002, January 20, 2003, and December 30, 2003). After 9/11, a former consular official named Michael Springmann will say that while serving in Jeddah during the Soviet-Afghan War he was sometimes pressured to reverse denials of visa applications by the CIA for apparent mujaheddin (see September 1987-March 1989). Shukrijumah - After 9/11, both Mohamed Atta and Adnan Shukrijumah are identified by the immigration officer as two of the men who visited her office. Upon seeing Shukrijumah’s photo, she will say that she is “75 percent sure” it is him, and will provide a description that matches his profile. 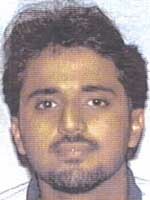 At this time, Shukrijumah is being investigated by the FBI and is thought to be a well-connected al-Qaeda operative (see November 2000-Spring 2002, (Spring 2001), April-May 2001, and March 21, 2003 and After). Atta and Marwan Alshehhi also attend a Florida mosque run by Shukrijumah’s father (see 2000-2001). An FBI informant sees both Atta and Adnan Shukrijumah at the mosque in early 2001, but he is unable to get close to them (see Early 2001). 9/11 hijacker pilot Hani Hanjour is pulled over for speeding on South George Mason Drive in Arlington, Virginia, for going 50-55 miles per hour in a 30 mph zone. He is driving a Chevrolet van rented two days before from Borough Jeep Chrysler in Wayne, New Jersey. He has a Florida driver’s license that gives his address as Miramar, Florida, where he lived in the mid-1990s (see Spring 1996). [CNN, 9/26/2001; CNN, 1/9/2002; Washington Post, 1/9/2002; US District Court for the Eastern District of Virginia, Alexandria Division, 7/31/2006 ] However, according to the 9/11 Commission, he did not have a Florida driver’s license, although he did have a Florida ID card. [9/11 Commission, 8/21/2004, pp. 32 ] Three weeks after the stop, Hanjour sends Arlington General District Court a money order for the $70 and $30 court costs. [Washington Post, 1/9/2002] Three other plot leaders are also stopped for speeding in the US (see April 1, 2001).